While most fans knew that Captain Marvel had started production quite some time ago, with photos and video surfacing from the set in late January, Marvel has confirmed that filming 'officially' began this week. Surprisingly, the studio also revealed three returning MCU characters, Clark Gregg as Agent Phil Coulson, Djimon Hounsou as Korath the Pursuer and Lee Pace as Ronan the Accuser. This marks the first time that Coulson has been seen in an MCU movie since his "death" in the 2012 blockbuster The Avengers, while both Korath and Ronan made their MCU debut in 2014's Guardians of the Galaxy, where they were both also killed off. Since Captain Marvel will be set in the 1990s, long before this trio of characters were killed off in the MCU, their return won't cause any continuity issues. What is also interesting, though, is Marvel fans have known since 2013 that Agent Coulson is still alive, heading up a S.H.I.E.L.D. team in secret on the ABC series Marvel's Agents of S.H.I.E.L.D., although none of the MCU characters on the movie side know he's still alive. Since it was Coulson's death that helped bring Earth's Mightiest Heroes together in the first Avengers movie, many had been wondering if or when these heroes may finally learn Coulson is still alive after all. 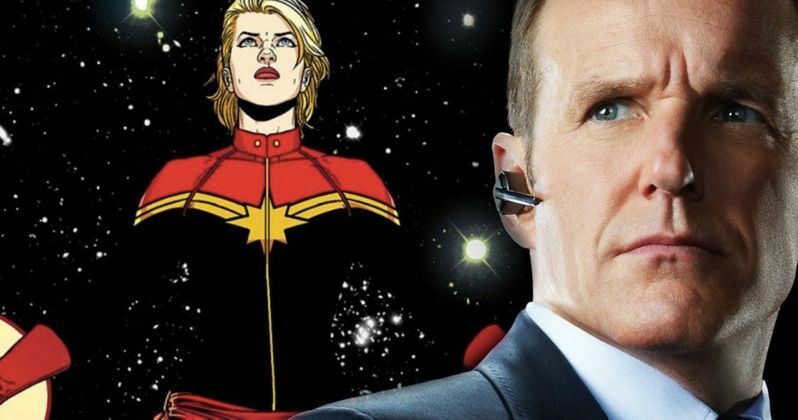 While the movie is set in the 1990s, since Captain Marvel is set between the events of Avengers: Infinity War and next year's Avengers 4, and since Brie Larson's Carol Danvers has been confirmed to appear in Avengers 4, it's possible that this Captain Marvel movie may end in present day, much like how Captain America: The First Avenger ended with a thawed-out Cap (Chris Evans) waking up in present-day New York City. While no present-day scenes have been confirmed for Captain Marvel, it would make sense to have some sort of transition from this 1990s origin story to present day, whether it be a post-credit scene or simply the final scene of the movie. It has already been confirmed that a large portion of the Captain Marvel story will be set in outer space, so it makes sense that characters from the cosmic side of the MCU like Korath the Pursuer and Ronan the Accuser are featured here. Whether or not they will make any sort of return in the present-day timeline of the MCU remains to be seen, and there is no word on any other previously-deceased MCU characters showing up in Captain Marvel. It has also been confirmed that this story will head into the Quantum Realm, which was first introduced in 2015's Ant-Man, so there could be an abundance of possibilities for existing MCU characters, deceased or otherwise, to return in Captain Marvel. The announcement from Marvel Studios also confirms the recent news that Lashanna Lynch has replaced DeWanda Wise, while revealing new cast members Algenis Perez Soto, Rune Temte and McKenna Grace in unspecified roles. The announcement also reveals that directors Anna Boden and Ryan Fleck also worked on the script alongside G.L.O.W. creators Liz Flahive and Carly Mensch, and previously-confirmed writers Nicole Perlman (Guardians of the Galaxy), Meg LeFauve (Inside Out) and Geneva Robertson-Dworet (Tomb Raider).